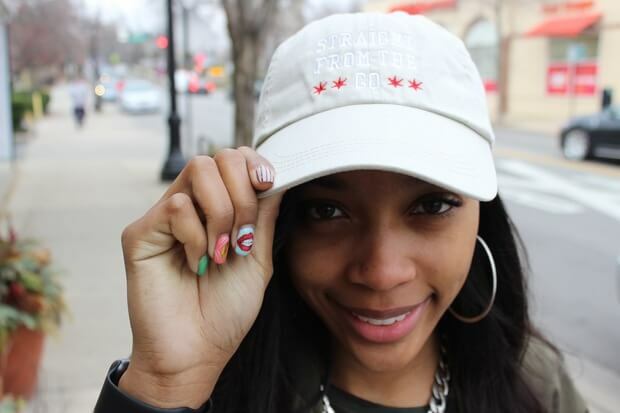 Chicago 17-year-old Raven Smith wants people to be proud to say they’re “Straight from the Go.” In an effort to combat the negative and violent connotation behind the label Chi-raq, Smith launched a brand that looks to associate Chicago with something more positive. “Straight from the Go means, ‘all good things come from Chicago,'” Raven’s mother Eraina Smith told Chicagoist (between school and a wave of media requests, Raven was not available to speak to us this week). At a time when Chicago is known for some far less flattering nicknames—read: “Chi-raq,” the nickname and movie title inspired by the city’s gun violence problem—Raven wanted to highlight the city’s more positive sides. After Raven, who is an only child, came to her mom with the idea last winter, Eraina Smith and her husband quickly helped her set up a website and research trademarking. The shirts first made their public debut in December, when they were donned by the Morgan Park High School men’s basketball team at the Proviso West Holiday Basketball Tournament. But even with the endorsement of a top-ranked local team, Smith said they never anticipated the amount of support that would pour in. There was the appearances on CBS and Windy City Live. The support of local businesses, like Belle Up downtown and in Beverly, and The Shop 147 on the South Shore, which now carry the shirts. There were the thousands of tweets, thankful emails and a recent invitation to attend the Black Women’s Expo in Chicago early next month. There was a call from Mayor Rahm Emanuel to her principal to praise Raven. The foundation named for Kanye West’s mother, Donda’s House, shared Straight from the Go on its Facebook page Monday. And the T-shirt orders came in from across the country. The t-shirts were in part inspired by tragedy. Weeks prior its launch, one of Raven’s friends was killed at 76th Street and Dorchester Avenue on the South Shore. In response, Straight from the Go is donating profits from its T-shirts—which are modeled after the Chicago flag—to both help quell violence and support positive efforts. So far, Raven, who will be attending Millikin University next year, has donated about $250 to her former school, Poe Elementary, which was holding a fundraiser due to budget cuts, according to DNAInfo. Future causes could include providing reward money to people with information about criminal offenses, or funding organizations that provide an alternative to violence. Smith said that because the effort grew so quickly, they initially did not have a specific charitable organization in mind. For now, much of Raven’s efforts are going towards sending her message and rebranding the city. In addition to media and sales, she’s given away about 100 shirts to kids, packaged with pamphlets explaining the movement.